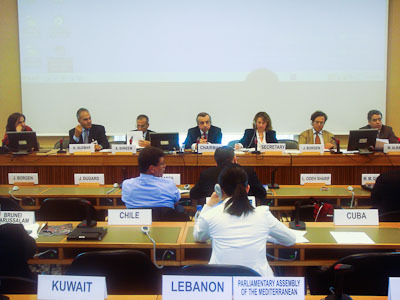 At the United Nations offices in Geneva, Switzerland, the Committee on the Exercise of the Inalienable Rights of the Palestinian People are meeting on 3-4 April to discuss the question of Palestine, the situation of Palestinian political prisoners, legal and political implications of Israeli prisons and detention facilities, and the role of the international community. As Vice Chair of the Committee, H.E. Zahir Tanin, Ambassador and Permanent Representative of Afghanistan to the UN is in attendance. Other participants include representatives of UN Member States and Observers, intergovernmental organizations, UN entities, academia, civil society organizations and the media. At the opening session, Maxwell Gaylard, Deputy UN Special Coordinator for the Middle East Peace Process, delivered a message from Secretary General Ban Ki-Moon.Â He stated that, â€œthe Middle East peace process is at a dangerous impasse. Â The target date set by the Quartet for an agreement by the end of this year remains the objective. Â The Quartet will continue to work toward this goal. In parallel, we must all do our part to bolster the Palestinian Authority and ensure progress on State-building and addressing the dire financial situation of the Palestinian Authority.â€ Abdou Salam Diallo, Chairman of the Committee on the Exercise on the Inalienable Rights of the Palestinian People, and the Issa Quaraqe, Minister of the Palestinian Authority for Prisonersâ€™ Affairs also spoke at the opening session. This afternoon, a meeting was held the first of three thematic discussions set out in its agenda, on humanitarian and legal aspects of Palestinian political prisoners in Israeli prisons and detention facilities.Â H.E. Ambassador Zahir Tanin chaired the first thematic discussion. The meeting will conclude after two plenaries on 4 April.